This wall monument is made of alabaster (a soft stone, a form of gypsum, that is easy to carve) and black marble. It was originally installed in the church of St Denis, Faxton, Northamptonshire, along with other funerary monuments to members of the Nicholls family. 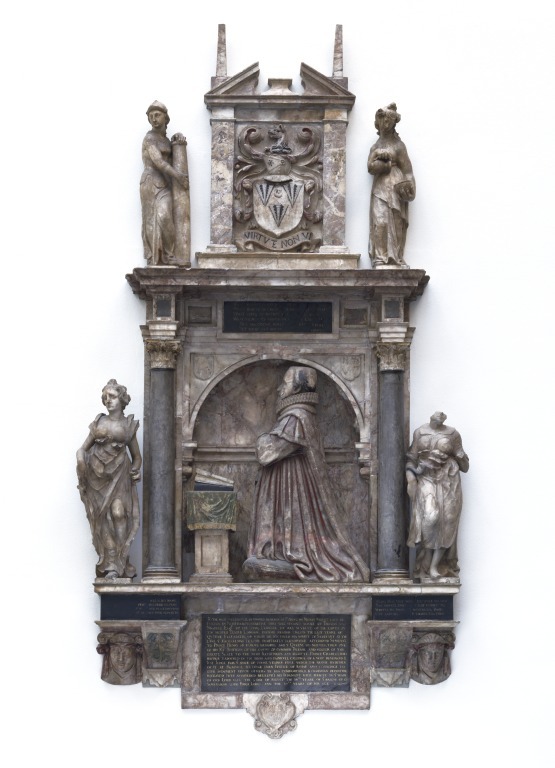 Sir Augustine Nicolls (1559-1616) is shown in his judge's robes kneeling on a cushion in full profile to the left, before a prie-dieu (praying desk or kneeling desk) with books. He is flanked by figures representing Justice and Prudence, virtues appropriate for a judge. Between the two figures representing Fortitude and Temperance above is the Nicolls coat of arms. The church of Faxton in Northamptonshire fell into disrepair during the 20th century, the hamlet of Faxton itself having long since disappeared. It was in a remote position, two miles north-east of Lamport. In 1958 the church was demolished, the monuments having been removed to the stables of Lamport Rectory. In 1965 the V&A agreed to accept the monuments in the stables as a gift. By then they were in poor condition, and a good deal of conservation work was undertaken by the Museum's Conservation Department. Nicholas Stone (born about 1587, died 1647) was the most important English sculptor of the first half of the 17th century. He trained in The Netherlands, in the workshop of Hendrik de Keyser (1565-1621) in Amsterdam, from about 1607. He married de Keyser's daughter and returned to London in 1613. 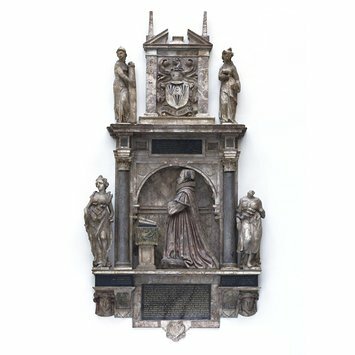 Although Stone was also active as an architect (he was appointed Master Mason and Architect at Windsor Castle, Berkshire, in 1626), he is best remembered for the fine marble and alabaster tombs he erected during the 1620s and 1630s. He appears to have stopped work with the outbreak of the Civil War in 1642. Monument, alabaster in relief. The deceased is shown kneeling on a cushion in full profile to the left, before a prie-dieu with books. The effigy is set within a coffered arch flanked by columns, supporting an entablature. There are two partly defaced coats of arms in the spandrels. Outside the columns are figures representing Justice and Prudence, while over the cornice are figures, on a smaller scale, of Fortitude and Temperance. The latter flank the Nicolls coat of arms, set between pilasters and under a broken pediment surmounted by two small obelisks. The coat appears again on a cartouche under the main inscription. Above and below the effigy, and under Justice and Prudence are inscriptions on black marble slabs. The main inscription immediately under the effigy is complete and easily legible; but parts of the others are missing. Apart from the black marble slabs and the two columns, which are in grey marble. the whole monument is in alabaster. The effigy is naturalistically coloured and there are traces of colour and gilding elsewhere. The monument contains four panels with inscriptions. From the demolished church of St Denis, Faxton, Northamptonshire. Given to the Museum by the Rector and Churchwardens of Lamport with Faxton in 1965, together with Mus. Nos: A.10-1965, A.11-1965 and A.12-1965. Historical significance: The hamlet of Faxton, is an abandoned village and chapelry in the county of Northamptonshire in England in a remote position two miles to the north-east of Lamport. In the Domesday Book it was a village of thirty-two families. By 1801 the total population was 54. By 1841 it had risen to 108 but by 1921 it was 37. No one lives in the village now. in 1939 services in the church came to an end. Eventually lead was stripped from the roof and in 1958 it was demolished as a 'dangerous structure'. The wall monuments were removed in pieces to the stables of Lamport rectory. In 1965, the Museum agreed to accept the monuments in the rectory stables as a gift. By then they were in poor condition and the reassembly of the monument was laborious and complex. Three memorials in Faxton church have not come to the Museum. A plain slabe to Elizabeth Framwell, who died in 1781, has been included in the paving round the base of the column that marks the site of Faxton church. Another simple slab to Susanna Danvers, who died in 1730, daughter of Sir Edward Nicolls, second baronet, has disappeared, although it was photographered by the National Buildings Record in 1945. The monument to Hester Raynsfor, born Isham, who died in 1763, was installed in the Ishal chapel in Lamport church. It was executed by William Cox of Northampton (b. 1717, d. 1793). Hodgkinson, T. 'Monuments from Faxton Church Northamptonshire in the Victoria and Albert Museum', Northamptonshire Past and Present, 1971/2, p. 335. Bridges, John, History and Antiquities of Northamptonshire, II, 1791, p. 95. Whellan, F and Co, History, Topography and Directory of Northamptonshire, London, 1874, p. 867. Spiery, W.L, 'The Notebook and Account Book of Nicholas Stone' in Walpole Society, VII, 1919. Victoria County History of the county of Northampton IV, 1937, p. 167. Isham, Gyles, The Ishal Chapel at the church of All Hallows, Lamport, Northamptonshire 1965, Monument 5. Lewis, Shelagh, Northamptonshire Past and Presnet I, 6, 1953, pp. 19-38.